Walk with the 2.0 generation and discover all the aspects of the park ! 5 days to discover, move, get some fresh air in a huge life-size playground ! Read the last projects and organisations of the Grand Parc : Orangina Suntory France, a sustainable partnership on water and the environment. The strategic lines of the Grand Parc 2030. The famous nature strolls of Greater Lyon are suggested now on digital version with "Grand Lyon nature" app. The aim is that strollers discover natural and fitted areas while highlighting their biodiversity, landscapes and history. You want to try our 2 strolls ? Download the Grand Lyon Nature app on your tablet or smartphone and follow the guide ! The app will show you the starting car park and will guide you throughout your path geolocalised on the Grand Parc. These paths may be done on foot or by bike. Make sure you have appropriate equipment : sportswear, helmet, remember to keep hydrated, especially children. An interactive path including an audio guide incorporated into the app. Situated at the heart of wild and farming areas of the park, this discovery path reveals different landscapes of the river linked with a story. In the course of 10 breaks, it recounts choices that have marked this area and that still keep modifying this place. Fanny, her mother and her grandfather take you to the discovery of the history of Miribel Jonage Island. During this stroll you can discover the local fauna the Allivoz through 5 places linked with water and which are typical of the Grand Parc: L’îloz’ and its 2 gardens, the Jonage Canal, the alluvial wood of the Vieux Rhône, the riverbanks and the lake of the Allivoz. 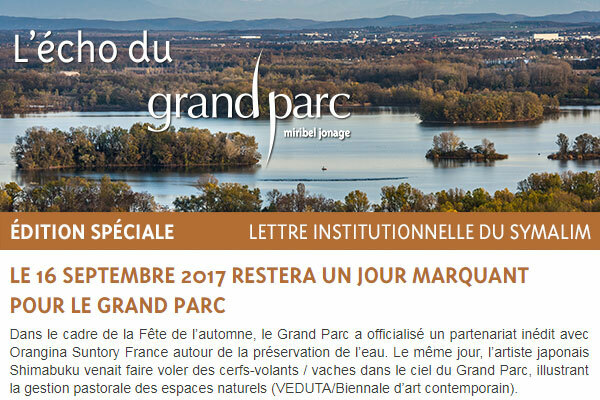 Mark the Grand Parc on Tripadvisor ! Receive all the news subscribing to our newsletter !